This page is dedicated to the amateur radio community and lists information related to our active satellite missions. All missions use half-duplex communications. Therefore, the above listed frequencies are valid for Up- and Downlink. A GNU radio out of tree (OOT) module is published on GitHub which can be used to demodulate raw data frames from our satellites. It demodulates the bit stream modulated with GMSK and also the Mobitex data-link layer protocol. Additionally, the Soundmodem from UZ7HO supports demodulation of Mobitex frames. The standard baudrate is 4800 bps but can be switched to 9600 bps for increased channel capacity at higher elevations. Each transmission at the higher baudrate is announced by a small 4800 bps header to allow for adaptive receiver re-configuration. The output power of the satellites is 27 dBm (0.5 W) for all BEESATs and 30 dBm (1 W) for TechnoSat using quarter-wave monopole antennas with toroidal radiation pattern. On the data-link layer - as described by the OSI model - all BEESATs and TechnoSat make use of the Mobitex protocol. 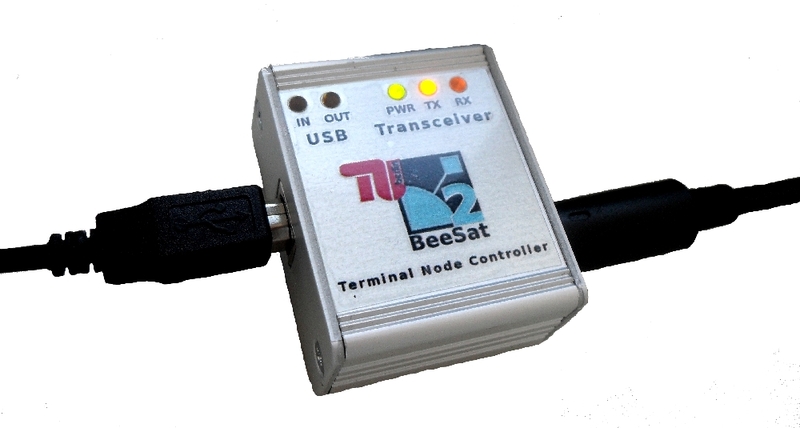 The modem chip used on BEESAT-1 to -4 is CML CMX909b. It includes scrambling and interleaving features and forward error correction is also performed internally. The transport layer uses individual frame headers for addressing multiple satellites and for handling variable length messages. Additionally, backward error correction adds to data consistency and transmission safety when needed. Both protocol features are realized by the attached microcontroller of the on-board and groundstation TNC.